When do people need to act more sustainably? By quickly reaching higher levels of sustainability, people will avoid problems that would make achieving a sustainable condition more difficult. For example, getting pollutants like plastic out of oceans, rivers and lakes maybe impossible. Reducing single use plastics, recycling, and preventing release of waste to the environment are steps we can easily take to limit how much worse the buildup of pollutants gets. When did we start to see the effects of human action on the climate? In the mid-1980s, global average temperatures started to noticeably increase. From 1988 through 2017, there hasn’t been a cooler than average month. During this period, Artic ice has decreased dramatically. Extreme weather events, such as major hurricanes and droughts are becoming more severe and more frequent. Therefore, we started to see the effects of human action on the climate in the 1980s. The five warmest years in recorded history have all occurred since 2010. The following chart illustrates how atmospheric carbon dioxide concentrations have increased over time and how the global temperatures have varied from historic averages. When did the amount of greenhouse gases in the atmosphere get to be too high? From about 1950 to about 1990, atmospheric carbon dioxide concentations went from about 300 parts per million (ppm) to about 350 ppm. Prior to 1950, carbon dioxide concentrations hadn’t exceeded 300 ppm for hundreds of thousands of years. Many scientists consider 350 ppm to be the upper acceptable limit. Carbon dioxide is one greenhouse gas; others, especially methane, are also very significant. Therefore, it can be concluded that greenhouse gases in the atmospere got to be too high before 1990. Carbon emissions increased dramatically from 1950 to 2013. We need to reduce carbon emissions – ultimately to zero – and then work on net removal of greenhouse gases to get atmosheric greenhouse gas levels back down to levels last observed in the 1980s. 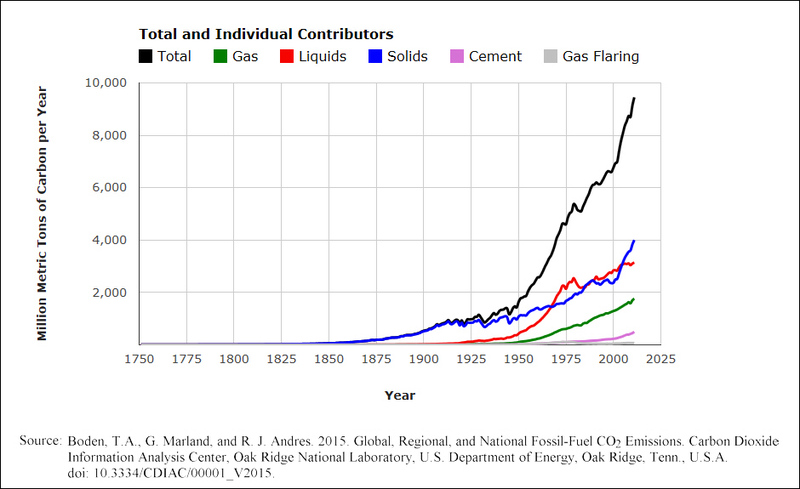 When did people start to understand that fossil fuel combustion could impact the climate? In the 1850s, Eunice Foote and John Tyndall separately discovered that water vapor and carbon dioxide trap heat from solar radiation. In 1896 Svante Arrhenius published the idea that fossil fuel combustion could eventually lead to global warming. He estimated that doubling carbon dioxide in the atmosphere could cause a 5 degree Celsius temperature rise. But, this wasn’t a big concern 120 years ago when there were only about 1.5 billion people who weren’t burning a lot of fuel. Advances over the past 120 years have allowed for an ever increasing understanding of the science behind global warming. In the 1940s, instrumentation allowed for measurements of long-wave radiation and it was determined that carbon dioxide absorbs infrared radiation. In 1955 Gilbert Plass explained that water vapor and carbon dioxide interact with different wavelengths and that carbon dioxide was trapping energy that would otherwise be lost out to space. When can I start start making a difference? When should I have conversations about sustainability?